I myself faced tremendous difficulty while trying to wean myself off an antidepressant called amitriptyline. Like many of its counterparts, amitryptiline also has drowsiness as one of its side effects. Consequently, insomnia as a result of withdrawal from amitriptyline was a major problem for me. From a high of 75 mg, I was able to reduce the dosage to 25 mg at the rate of 5- 10 mg every fortnight without much trouble. However, reducing dosage from 25 mg onwards was a nightmare - no pun intended. I started experiencing disturbing vivid dreams that made it impossible for me to get restful sleep. When I encountered this problem the first time, I tried a variety of sleep-promoting, relaxing herbs including Valerian, Chamomile and Californian Poppy. Valerian did seem to help a little bit in that I could go to bed early. However, the recurrent nightmares were not reduced in any way. I then tried taking a combination of multiple herbs together and also added hypnosis and white noise to the mix. It still didn't make any difference. The struggle continued for several months and I bounced around from one doctor to another trying to find a solution. In desperation, I even attempted using sleep medications but there was still no respite from the disturbing dreams. How Manasamrita Vatakam helped me? Eventually, my search took me to an Ayurvedic doctor who suggested using Manasamrita Vatakam as a temporary substitute for amitriptyline during the withdrawal period. He started me with two tablets to be taken one hour before bedtime. He advised that I continue with amitriptyline 25 mg for the first two weeks and then reduce it by 5 mg every couple of weeks from thereon. Manasamrita Vatakam started working from the first week itself. There were no nightmares. Sleep hours continue to be reduced but I did not feel as exhausted as earlier. I also noticed an improved level of focus at work. 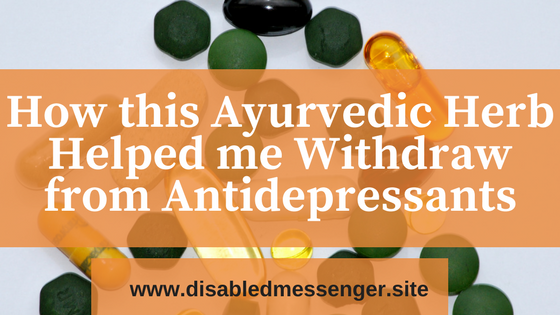 Encouraged by this success, I experimented with reducing amitriptyline 5 mg every week instead of every fortnight. Here also I didn't face any problem. Eventually, I was able to come off amitriptyline within a month. I then continued with one tablet of Manasamrita Vatakam for the next 15 days before stopping it altogether. Since then, I have used it to successfully come off other other medications like Venlafaxine and Escitalopram also. What Does Research Say About Manasamrita Vatakam? The studies that I came across seem to confirm that it may have beneficial anti-stress and relaxation properties. For example, this study indicates that it is comparable to Klonopin, a medicine used for treating generalized anxiety disorder among other medical conditions. The difference between the two, of course, is that Manasamrita Vatakam is not supposed to be habit forming. A study on rats' brains indicates that Manasamrita Vatakam may have neuroprotective effects. It also mentions that the medicine has long been used in India for psychosomatic diseases. And finally, this research article claims that it may be used to even treat cerebral palsy. When I looked around for more information on this medication, I found that one of its ingredients is of this medicine to be holy basil. This herb has numerous research studies that describe its benefits ranging from antimicrobial and immunomodulatory to antidepressant and antioxidant action. So perhaps the presence of holy basil contributes to therapeutic effects of Manasamrita Vatakam. Where to Buy Manasamrita Vatakam? Although it is sold in the US as a supplement that can be easily purchased from Amazon, I would advise patients to consult an Ayurvedic practitioner before starting with it. I have found this directory to be useful in searching for doctors. At the time of composing this blog post, I could find 845 doctors in the US listed in it. You can also reach out to Yoga Retreat Centres such as Mount Madonna in California to get recommendations on Ayurvedic doctors.